NIKOLAI MAXIMOV, BILLIONAIRE WILL-O’-THE-WISP, OR BLAST OF MARSH GAS? In European folklore, will-o’-the-wisps are lambent flames seen flickering over bogs and fens, and known by many different names and stories. 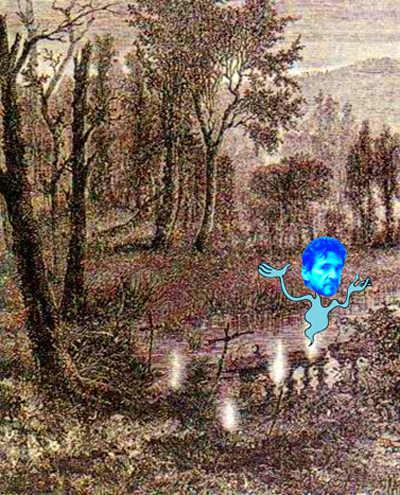 Usually explicable as methane igniting, in some Baltic mythologies the will-o’-the-wisp is believed to signal buried treasure. In others, the ignition is believed to be the trick of a mendacious imp intent on leading unwary travellers to misfortune. In the history of the Russian steel business since 1990, just two men have gone bankrupt while trying to create steelmill empires, and including them, four groups have collapsed. Considering how small their indebtedness was compared to the likes of the steel majors – Evraz, Severstal, Mechel – they might think of themselves as plucky, but unlucky. Nikolai Maximov (image) went down in the second half of 2007, even before the collapse of global steel demand and prices in autumn of 2008. His accumulated debts in October of 2007, before his enterprises were rescued by the Novolipetsk steel group (NLMK) of Vladimir Lisin, came to about $1.4 billion. Vadim Vashavsky dropped next, having borrowed at least $1.1 billion against the security of his Estar group’s steelmills; spent it elsewhere; and defaulted on repayment obligations. The biggest beneficiary of Varshavsky’s improvidence has been Igor Zyuzin, whose Mechel group has taken over most of the Estar mills. Two other steel magnates have also failed to emerge from the 2008 crisis. The first, Victor Makushin, whose steel scrap exporting group MAIR went under in 2009, closed his business down because of falling revenues and dwindling profits. However, because he operated privately and traded in secrecy, there is no telling what his debts were. The second, Igor Konovalov, owned a steel processor and trading group called Inprom, managed to stave off a $175 million debt default in 2008 and 2009, failed to make good on a domestic share sale; couldn’t persuade a troop of foreign buyers to come to the rescue; and ended up being acquired by Evraz at the end of last year for about $20 million. It’s been less than three years since financial ruin struck the Russian steel sector, and the only comeback in this group looks to be Maximov. That is if he can be believed when he announced on June 2 that he has a plan to build three spanking new steelmills in Ryazan, Tatarstan, and Vladimir for a total outlay of around $3 billion. How Maximov can afford to do that is a question he takes pains to avoid answering. Maximov has been reported in the Moscow press and by bank sources as having invested his cash payment from Lisin of $300 million to buy a 1.4% stake in the state savings bank, Sberbank. It is unclear when exactly that was, and whether Maximov has kept his shares to use for his new steelmill plan. Immediately after the NLMK payoff, Sberbank was at its peak price above $4.40 per share, but then during 2008 it crashed to a low of 39 cents. During 2010, Sberbank was worth roughly the same as it was during 2007. At today’s price, and if he still owns 1.4%, Maximov’s Sberbank stake is worth $1.1 billion. Maximov also claimed in the same interview that he will soon start other steelmill projects in the Vladimir region, 110 miles southeast of Moscow, and in Tartarstan. The projects are due to start next year and to come on line in 2014-2016. Neither the Vladimir region nor the Tartarstan republic administrations responded to questions about these claims. Maximov’s borrowing capacity also depends on how you read one of the most extraordinary archives of litigation in the Russian courts in recent history. Lisin’s NLMK group have litigated through 82 separate trials for collection of about Rb11.3 billion ($404 million) in debts from about 30 Maximov companies. A total of 68 are claimed as victories by NLMK; 9 losses to Maximov; 4 were discontinued; and one is still pending. But that’s only the debt collection process. Another 15 trials have been held on charges by NLMK of illegal transactions, fraudulent accounting, concealment of debt, and cash-stripping by Maximov from the steelmill operations he sold to NLMK. Damages of Rb5 billion ($179 million) are claimed. NLMK say they has won 7 of the cases; lost 1; and have 7 still under way. According to documentation submitted to the courts in these cases, a valuation of the steelmaking assets Maximov sold to NLMK in 2007, assessed by American Appraisal, was no more than Rb6.6 billion (about $268 million). That, NLMK has testified in court, was a multiple of seven below Maximov’s selling price. For the 50% stake in the assets which Lisin originally agreed to buy from Maximov, he ought not to have paid more than $134 million. Maximov and his associates and companies have retaliated with 37 cases against the NLMK group, with a total sum in claim of Rb1.4 billion ($50 million). 15 have been won by Maximov; 15 lost; and seven are continuing. In a recent victory for Maximov, the International Commercial Court of Arbitration ruled on March 31 that Lisin still owes Maximov a payment of almost $320 million for the value of Maximov’s assets in the 2007 takeover.